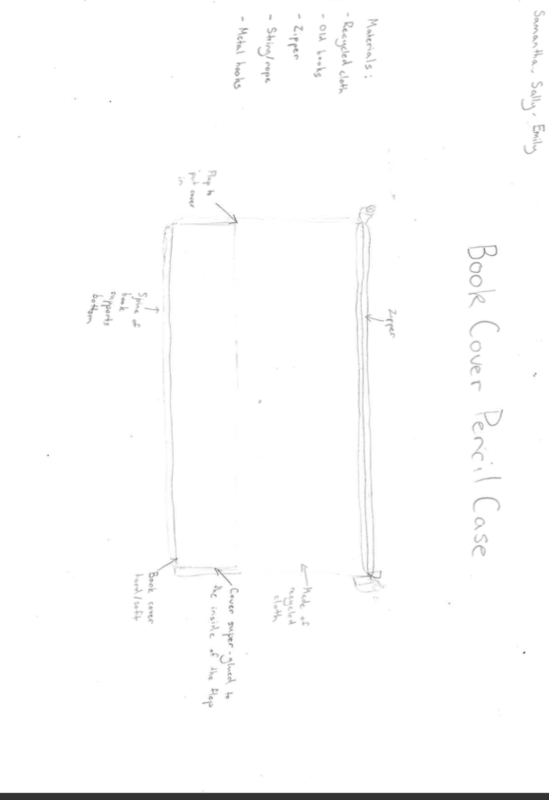 We plan to make a pencil case out of old discarded books, and it will have a small mesh bag. 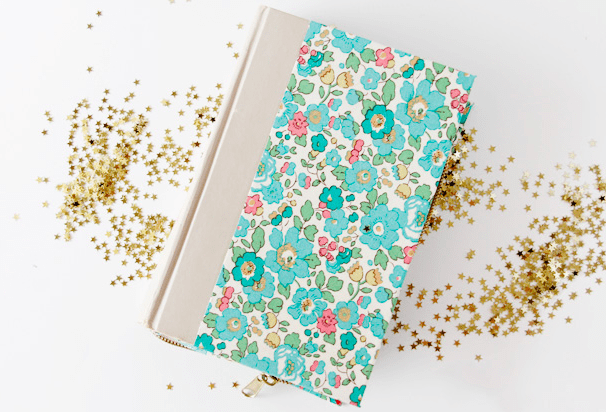 We will give a keychain to people who give us their old pencil case for us to upcycle it by making a new pencil case. Our target customers would be middle school female students because all the middle school female students answered very positively toward our product. 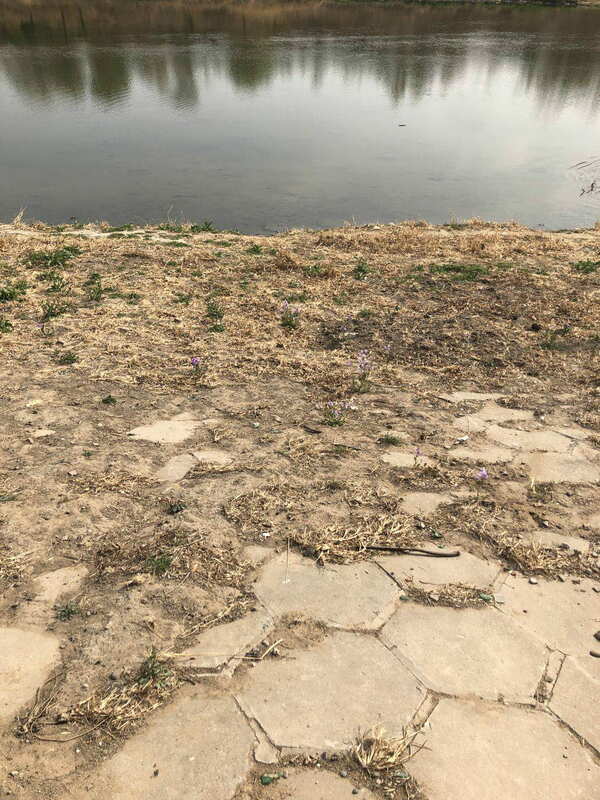 In March, we visited Wenyu River to collect the data. This is photo of site #1, as you can see, there are lots of plastic bottle caps that people threw away. 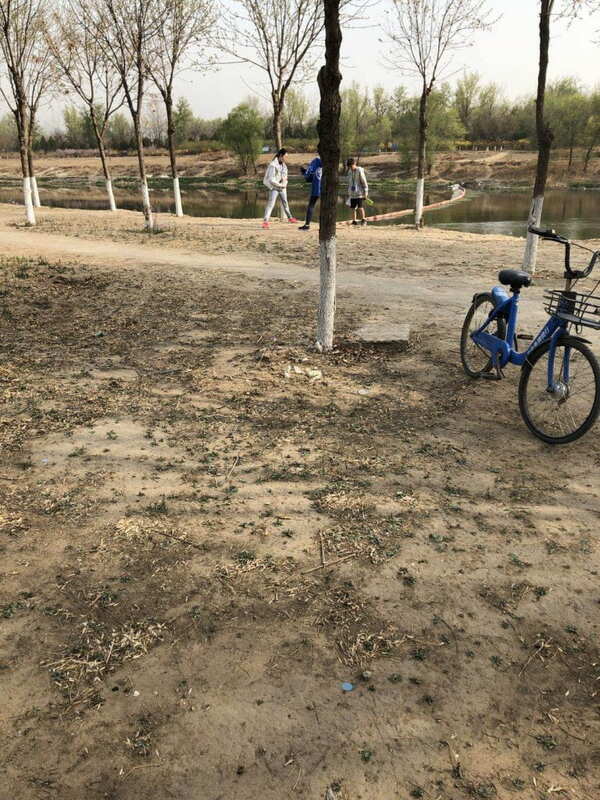 Also, there were some single use plastic plates left under the tree by the people who visited Wenyu River for a trip. This is photo of site #2, as you can see, there are some plastic bottle caps that people threw away. 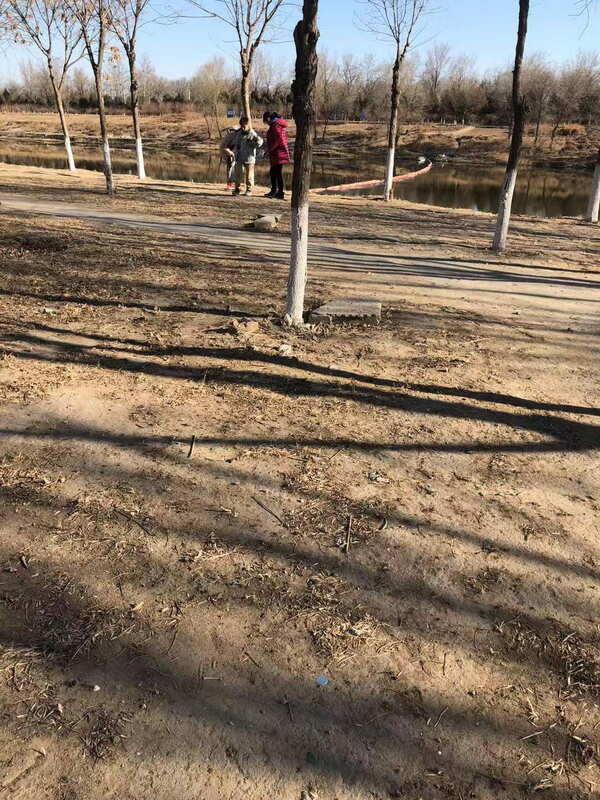 There weren’t any single use plastic plates, left by the people who visited Wenyu River to fish. 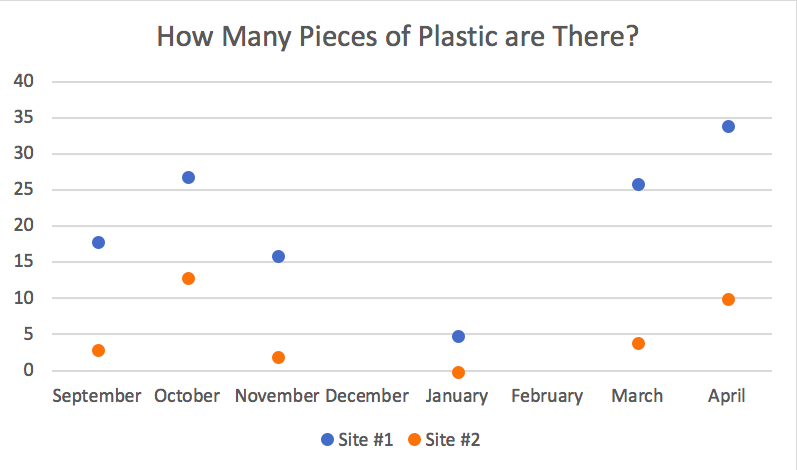 In April, number of the plastic waste in both site were increased by 8 for site 1, and 6 for site 2. As you can see on the graph, the data is changing as the temperature is changing, and it’s depending on how many people are visiting Wenyu River for a trip. I notice that the data is increasing even more than March because more people visited Wenyu River as temperature raised by 8.5 degree Celsius (NOAA). As the temperature of Beijing declined, the number of plastic waste decreased since people didn’t visit Wenyu River for a trip. 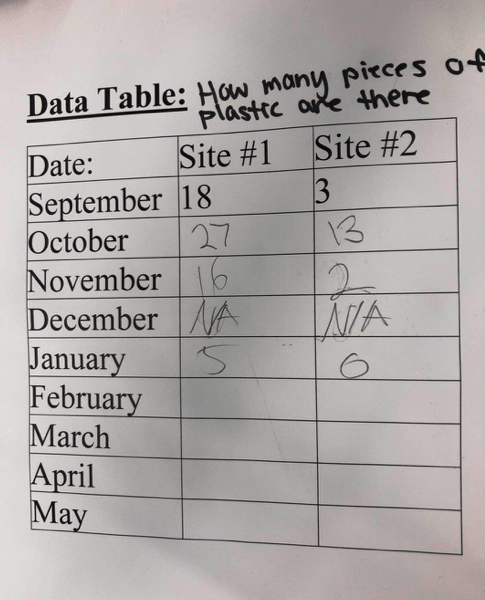 For example, in January, the number of plastic decreased dramatically by 11 for site #1 and by 2 for site #2, average temperature was -3 degree Celsius (NOAA). Next time we collect data, I wonder if the number of plastic waste will increase because average temperature in May raise by 6 degree Celsius in average, and people visit Wenyu River for a trip. 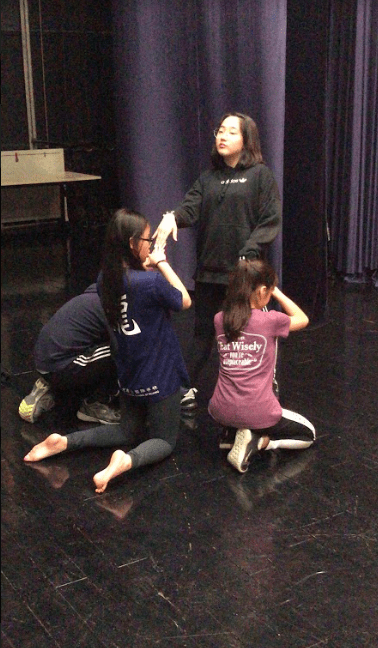 We presented three ideas during drama class: master and servant, child labor happening in coco farms, and status. This is master and servant. As you can see, I’m master and other 3 children are servants. Looking back on Project ReCharge, I learned that freedom and power are related. Also, I think the status in society is relates to freedom and power. For example, status in society can determine how much power you have in the society. Child laborer is one of the low status in society since they are young, and they are laboring in the farm or factories because they don’t have money. So, they don’t have a lot of power compare to the masters, and the owner of the farm. When they don’t have power, they can’t make their voice, and they don’t have as much freedom as we have. Before this project I used to think that there is no way to stop child labor, and it’s only happening in Less Economically Developed Countries (LEDCs). Now I think we can stop child labor by stop consuming the product of the company that employs children. 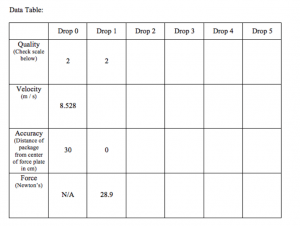 Also, there are children working in More Economically Developed Countries (MEDCs), too. For example, we can refuse using products from the company that hires children. There are several Non-Government Organizations (NGOs) such as Child Rights and You (CRY), CHILDLINE India Foundation. There are a lot of children working in factories and different work spaces in U.S. which one of the MEDCs. Looking back on Project ReCharge, I realize that lots of people from different status should work together to stop the child labor and consumers shouldn’t consume the product made from the children. For example, people who hires children to work, people who consumes the products made from the children, and the NGOs could work together to stop the child labor. Even if NGOs try hard to stop child labor, if the consumers keep consumes products made from child labor, there is no point trying to stop the child labor. Also, company might not agree to NGOs, and they might keep hire the children. However, if the consumers stop consuming the product that is made from children, companies will at least try to hire adults instead of children. 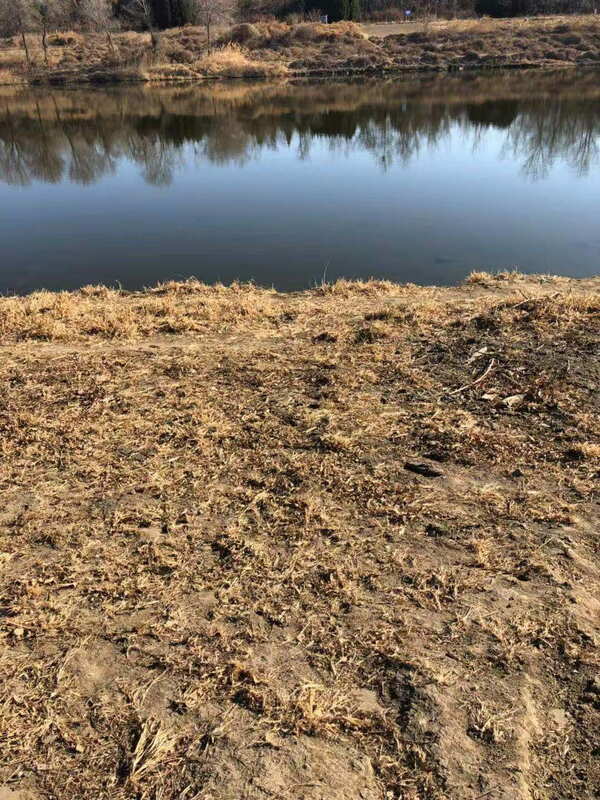 This is a photo of site 2. 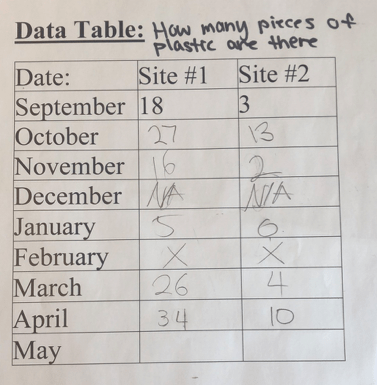 This is a photo of our data table. In March, the number of plastic wastes for site 1 had increased from 5 plastic wastes to 26 plastic wastes. 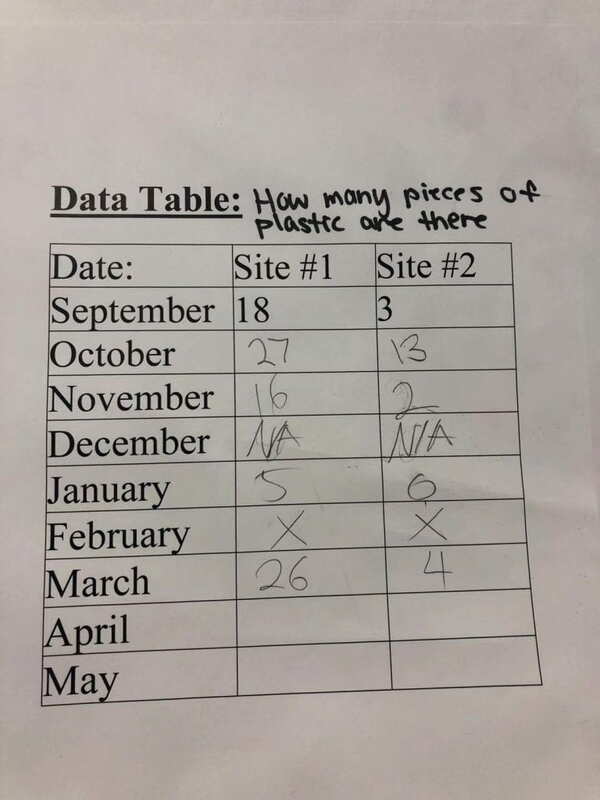 Also, the number of plastic wastes for site 2 was 0, and it had risen to 4 pieces of plastic wastes. I notice that the data is increasing again since the weather is much warmer. The average temperature of Beijing raised about 10 degrees Celsius. 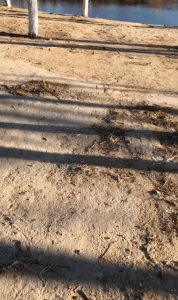 I believe that more people go to Wenyu River for a trip, and they are making a lot of wastes. 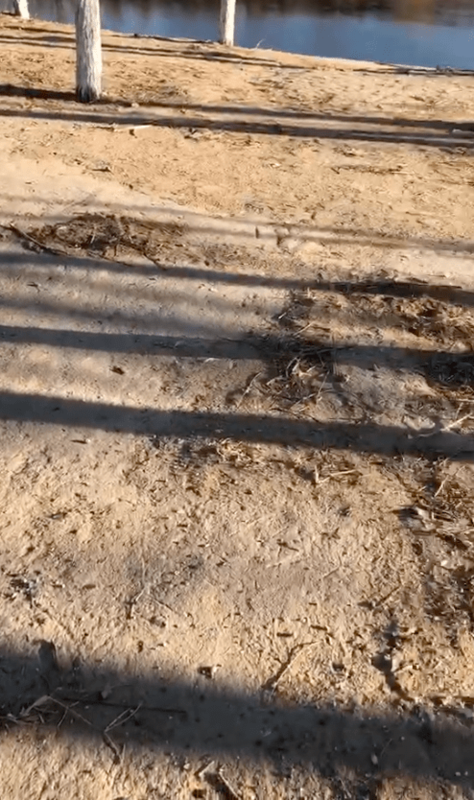 Next time we collect data, I wonder if the number of plastic wastes would increase dramatically because according to National Oceanic and Atmospheric Administration, NOAA, the temperature of Beijing raised about 10 degrees Celsius. 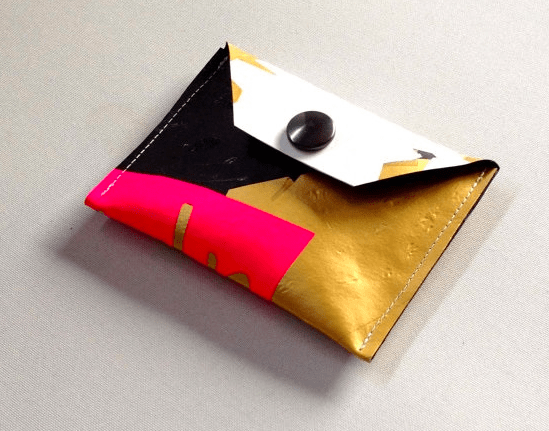 I was inspired by this wallet which is made out of plastic wastes. During this project, I will need to use soft plastics like plastic bags, and some buttons. I will need to learn how to use the presser, I will use presser to make my bag, and Ms. Rivera taught me how to use the presser. I got my ideas by googling the products made out of plastic wastes. 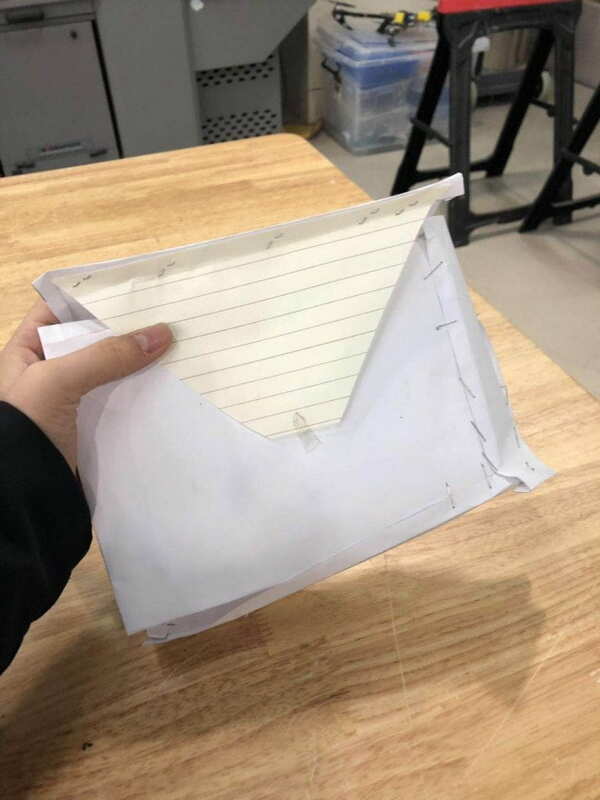 I will test it by making a prototype using the papers. 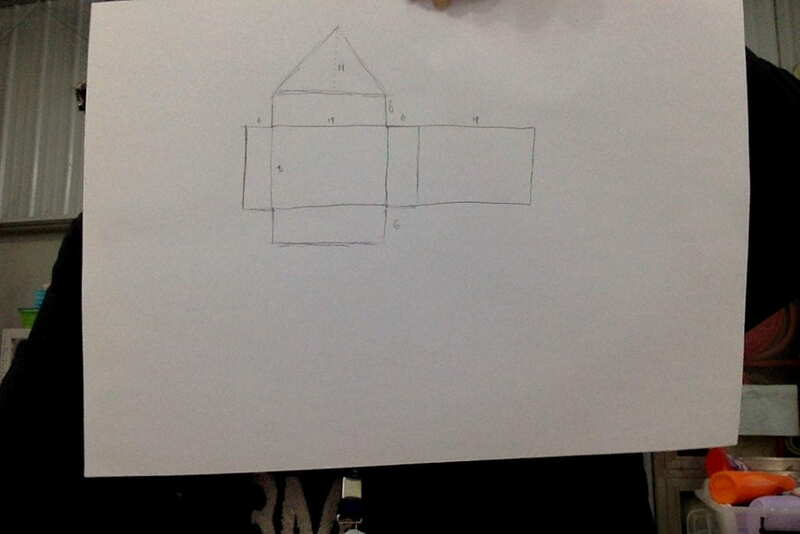 Below are a sketch and model of my design. Looking at my first and second prototype, I noticed that some parts are thin. One of the biggest challenges was that I couldn’t press all of my soft plastics since many people were waiting to use the presser. I struggled to punch a hole into the bag for the button because I had to measure where am I going to make the hole. After getting feedback from my user, I learned that some parts aren’t thick enough. 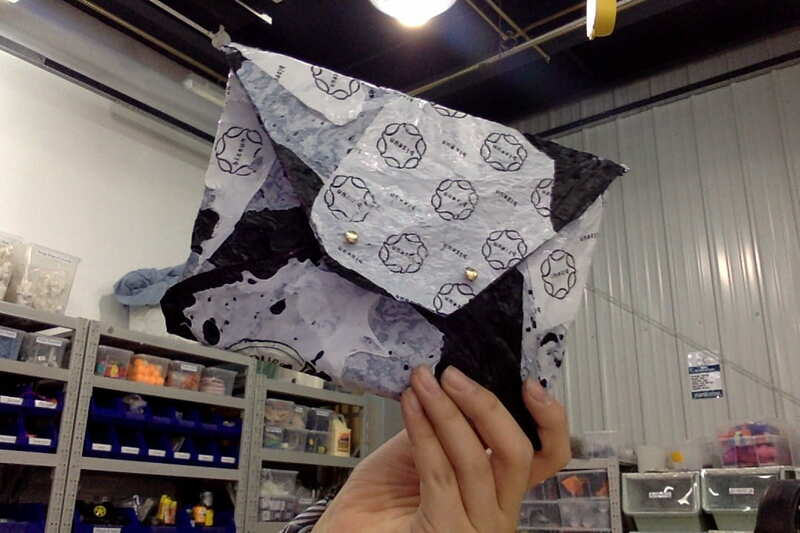 I took input from Ms. Rivera, and to improve my design, I sewed pieces to reinforce the thin sections. This is my final prototype. Looking back on this project, I learned how to solve the problems in short time, accurately. Knowing what I know now, I would make the pulse thicker. The mistake I learned from the most was when the layers of plastics were wrinkled. One skill I think I can use in the future is to press the plastic lightly, since it would wrinkle the plastics. One thing I am proud of doing is to being able to hand sew the materials together. Looking back on Collision, I learned that it is important to collaborate with teammates and combine our ideas together. 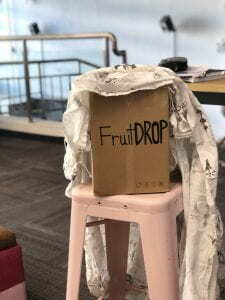 For example, my idea was to use fabric as a parachute instead of the plastic bag, and Emily’s idea was to attach the 2 parachutes to our product, and it was Sola’s idea to make layers of sponges to organize the fruits. Before this project, I used to think that more parachutes will reduce more velocity, but now I think too many parachutes might increase the velocity since the parachute has its own weight. 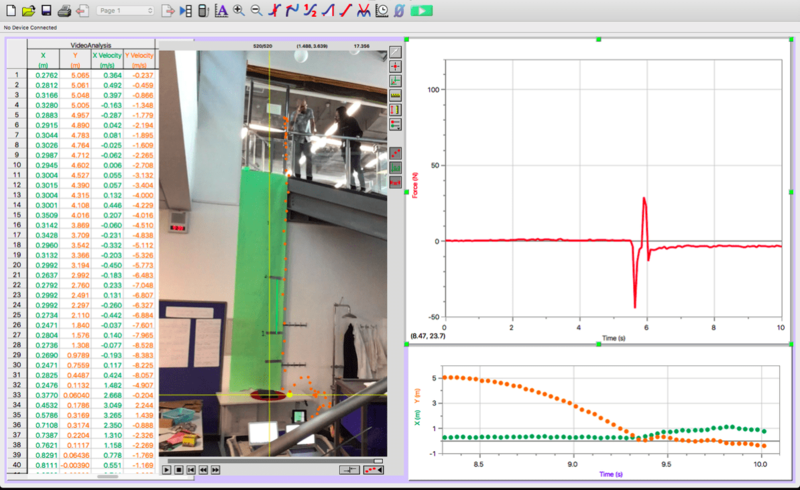 For example, we used fabrics for the parachute to reduce the velocity, but it didn’t reduce the velocity a lot, and it had less impact on our data than what I thought. 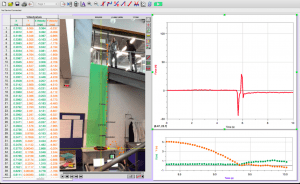 Looking back on Collision, I realize that it is very important to test the product several times since the external factors might affect the test result. For instance, when we used the fabric for the parachute, it was tangled and it didn’t reduce the force nor the velocity. This is our final product. On January 25th, Friday, we went to Wenyu River to collect the data. This is a photo taken on January 25th, 2019. As you can see, there are not a lot of plastics. 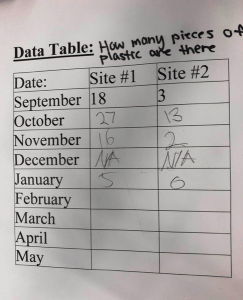 This is our data table, as you can see the number of plastic waste decreased dramatically. In January, the number of plastic wastes decreased dramatically. I notice that the data has declined as the temperature drops and the number of people visiting the Wenyu River for a trip decreased. Next time we collect data, I wonder if the number of plastic will increase since the temperature raises in February. This is a photo of our design 1. 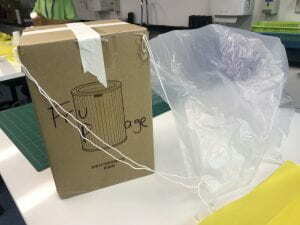 Our team constructed the first design using a small piece of clear plastic bag, string, hot glue, sponge, and a box. Multiple drops took place, and we noticed that the velocity slowly increased, and the velocity decreased a bit in the end. However, the velocity didn’t reduce a lot. The parachute wasn’t big enough to reduce the velocity of the package. Some things also went well. Big successes include the package hit the force plate (target), which tells us that it’s very accurate. For our next design, we will improve upon the first prototype by making a parachute that can actually reduce the velocity of the package. I wanted to make for my friends, and myself because we don’t have anything that is symbolic for our friendship. Last year, during October break I tried to make a dreamcatcher, and I kind of failed it. So, I want to try it again. I had prepared a lot of stuff for macrame, and I thought it would be nice to make these key rings. 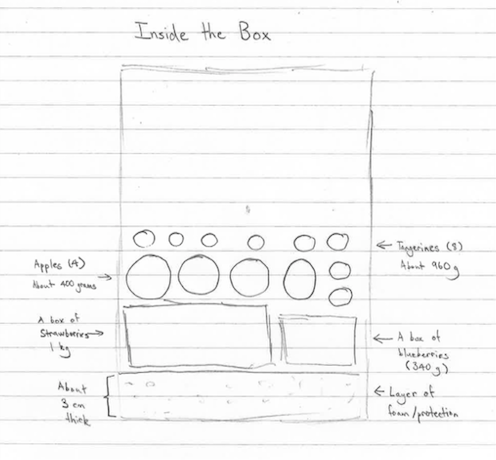 In Project Collisions, I am creating a system to deliver fruits by drones. The drone will release the package from a height up to 10 meters and my job as an engineer is to develop a solution so that the package is protected in its fall. The average time it took for our package to fall the 5 meters was 10 seconds. 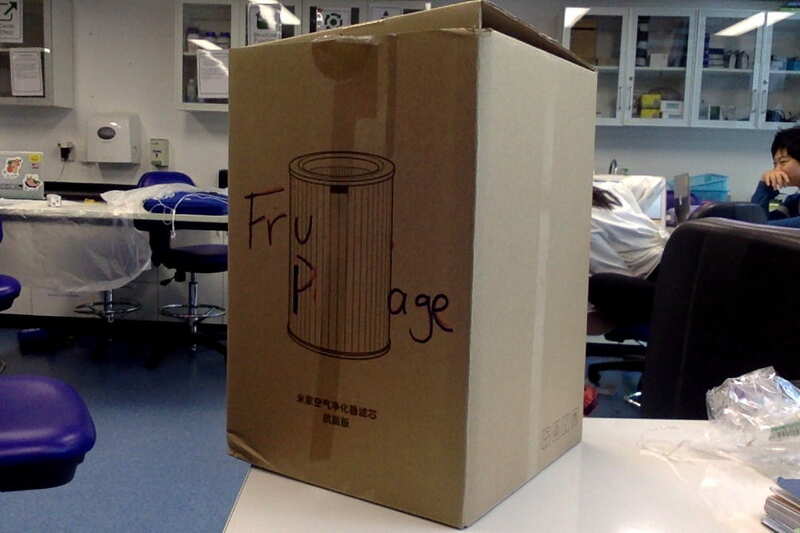 Using LoggerPro, we plotted out the fall of the package. A force plate at the bottom of the drop was used to collect data on the impact force of the package. Our group didn’t hit the force plate, and it was off by about 40~50cm. 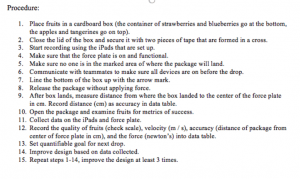 As a project metric for accuracy, we want our project to safely deliver the product without damaging the fruits. The average force on impact was 0 because the package didn’t hit the force plate. 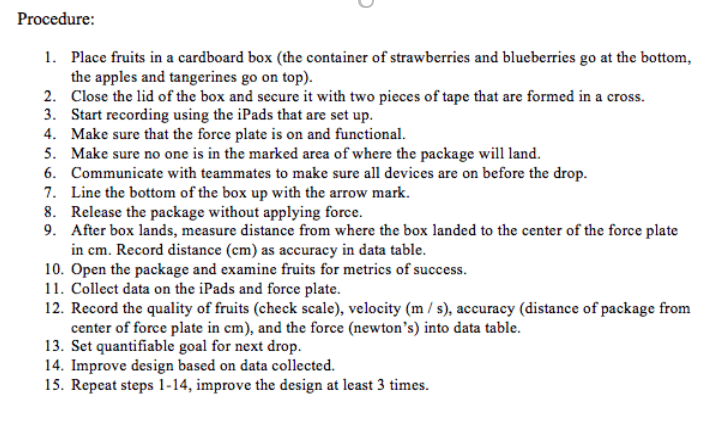 As a project metric, our group has decided to work on accuracy, because the package didn’t hit the target well. 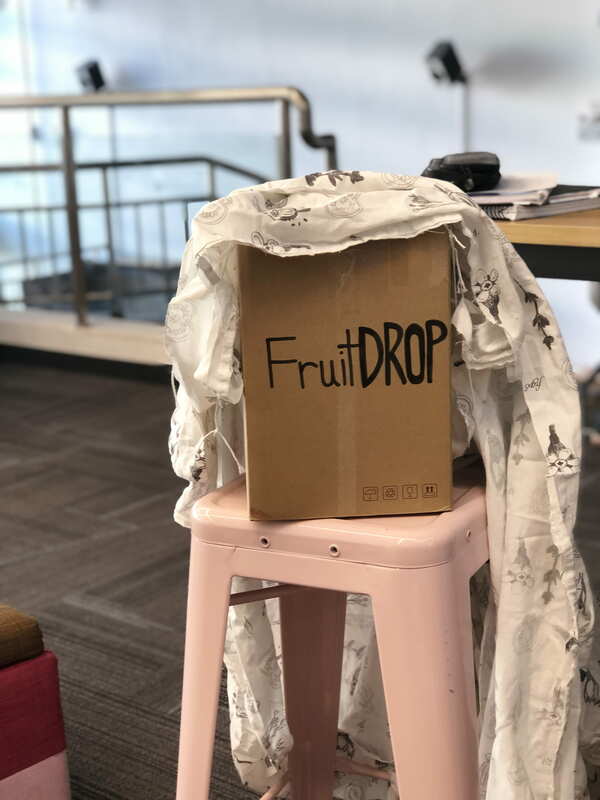 Our team has decided that the three most important criteria to design towards are the quality of fruit, accuracy, and soft landing. 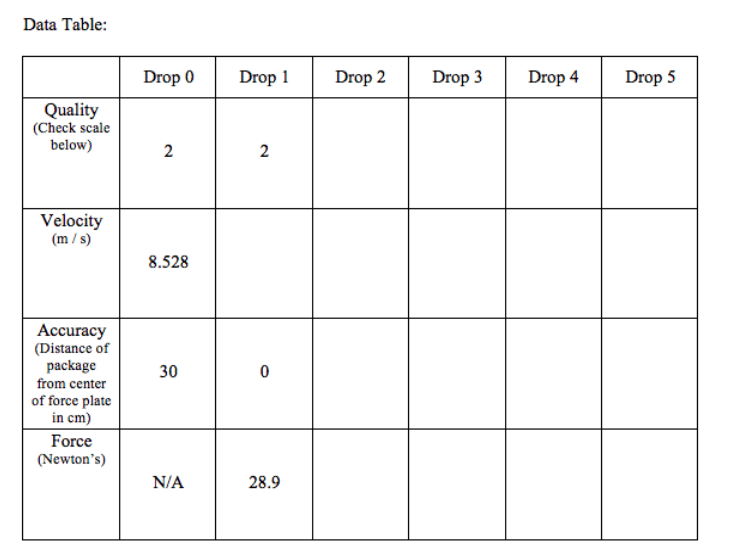 Below, each metric is described, and the goals were determined by data from Drop 0. Quality of fruit, strawberries, and blueberries was squashed they had water seeping out, our goal is to have the fruits intact. Accuracy, the package didn’t hit the force plate, our goal is to make sure that the package hits the force plate. Soft landing, our goal is to make sure that the package to land softly to have the fruits intact. 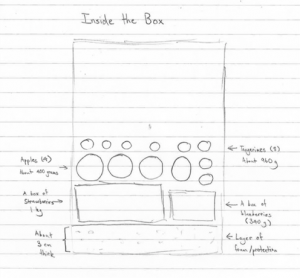 Our group is now building the first prototype. I hope that we can have all the fruits intact.